Speculative informal housing described by Sims (2012) as “one-off towers” has been a growing urbanization mode in Greater Cairo particularly after the January 2011 revolution. Built by profit-oriented developers they emerge, in spite of the government’s attempts to ban illegal construction, with striking heights, fulfil a large array of housing needs, and significantly impact informal areas where they develop. This research aims to understand how this self-organized housing provision takes place, what shelter outcomes it achieves and what socio-spatial impacts it triggers in the area it develops. The study is conducted on the case of “El Matareya”, which is a typical example for the 83% of informal settlements in Greater Cairo that have developed on private agricultural land (Sims, 2012). In addition, “El Matareya” has witnessed recent activity of speculative housing construction, thus socio-spatial impacts are well manifested. The main research question is: What are the socio-spatial impacts of the informal, speculative housing provision process on areas such as “El Matareya” since the January 2011 revolution? The sub-questions are: Which interactions take place in the informal, speculative housing provision process? What are their drivers? What governance characteristics affect the provision process? How does the recent development of the area, triggered by speculative housing provision, impact the space? What are the social manifestations of the provision process? 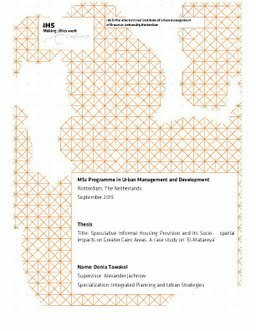 A literature review is conducted on informal urbanization, particularly informal speculative housing worldwide and in Greater Cairo, and on various self-organization concepts, from which a conceptual framework for the study is derived. The study investigates how trust and power relations, actors’ motivations and rule of law affect the interactions between the main actors during the housing provision process, thus leading to certain socio-spatial configurations. The research uses a case study design and qualitative data collection method to ensure a deep understanding of the complex relations between the beneficiaries of the provision process and to capture the contextual impacts and manifestations. During the fieldwork from June 14th till July 11th 2015, 16 semi-structured interviews and moreover discussions are conducted with developers, residents, regulator representatives and experts to cover the subject from the diverse perspectives. A diverse housing sample is studied, with a focus on speculative towers. Through site visits and structured observation the quality of speculative housing, and its relation and impact on the neighbourhood are investigated. Further on, secondary data is collected including reports on “El Matareya”, housing studies, relevant books and researches, law documents, papers and articles. Different data sources are used to ensure the validity of the research. The findings of the research show that informal speculative housing provision interactions, between developers, residents and the local district, lead to heterogeneous socio-spatial patterns in El-Matareya, that have positive but also a large extent of negative impacts on the area’s development. Patterns differ from one tower to another and from one provision process to another; however, there are general trends observable. The provision process is significantly impacted by the factors: decreased level of trust of residents to developers; prevailing economic motivation of the developers; power tensions but also collaborations between the local district and developers; and marginal surveillance and bureaucracy of the legal and institutional system. A commercialized housing product is realized, that satisfies many housing needs, but overloads and sometimes dominates the neighborhood’s services and resources. While it adds to the modernity and residents’ diversity of El-Matareya it decreases its social connectivity and identity. To conclude, the self-organized provision of speculative informal housing is responsive and adaptable to a large array of needs, yet taking place with minimal control, it often becomes distorted. The provision process and its manifestations indicate a seemingly intended deregulation and negligence of the state. Further on, they represent a complex continuum of legality and illegality; combining informal practices, part of which are tolerated by the state, or eventually become formalized and also formal and quasi-formal practices.